A long time ago, when SEO was much easier, webmasters, bloggers and other creatures of the Internet were much happier because they knew much more about their visitors’ search behavior. All they needed to do is go to Google Analytics reports and see which organic keywords were driving most of the traffic. But the winter came, Google increased the privacy of their users and took away what was so important to us, the information. The amount of (not provided) keywords spiked through the roof leaving bloggers and other users of Google Analytics speechless. And this story continues to this day. I kid you not, 99% of my search traffic did not include keyword data. All I had was (not provided) and Google Search Console reports (which are better than nothing but much weaker than what we had 6-7 years ago in GA). 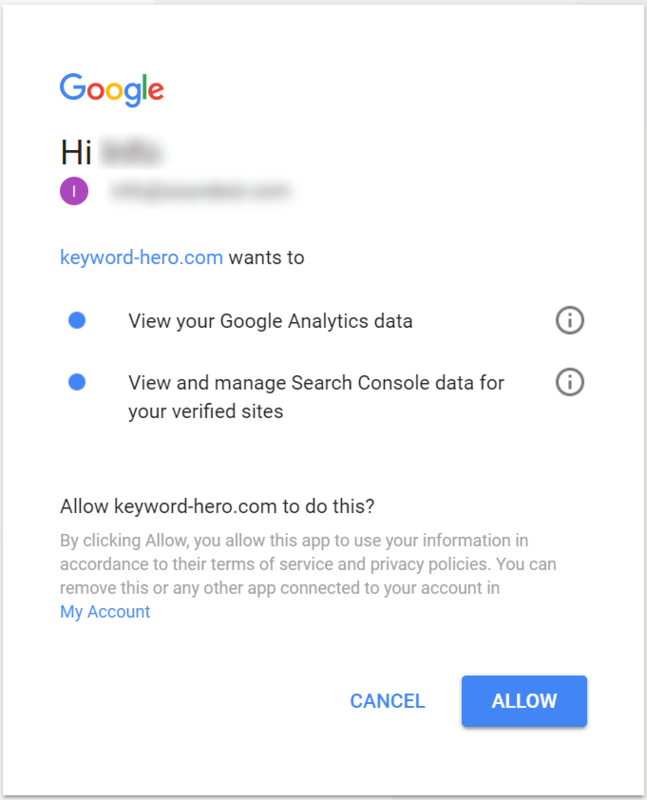 Fortunately, I have recently stumbled upon a solution which can practically unlock (not provided) keywords in Google Analytics reports, which is called Keyword Hero. Thanks to it, my (not provided) keywords decreased from 98% to 10%! What is the Keyword Hero? 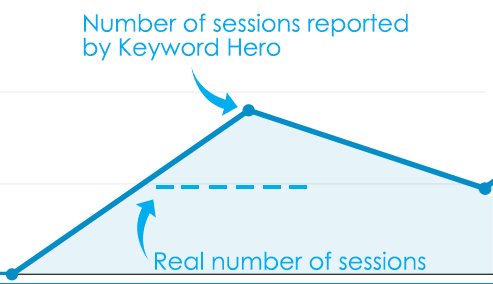 The Keyword Hero is the solution that puts the organic keywords back into Google Analytics. It is a comprehensive SEO tool and fully integrated into Google Analytics. The tool fetches data from your Google Analytics account, Search Console, and computes the keywords for your organic sessions. 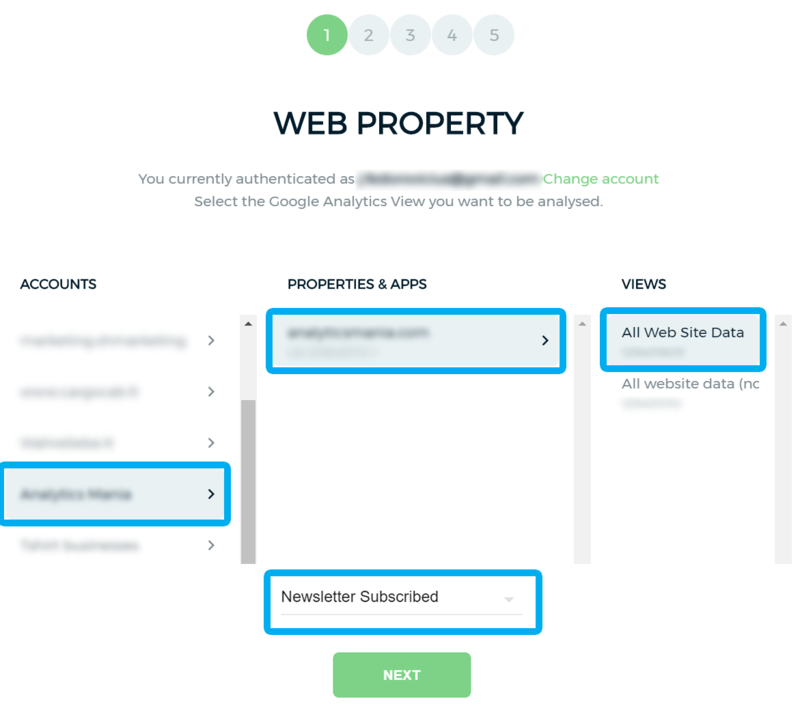 After the keyword matching process, the Hero uploads the data to your newly created Keyword Hero Property inside your Google Analytics account. How Does The Keyword Hero Work? 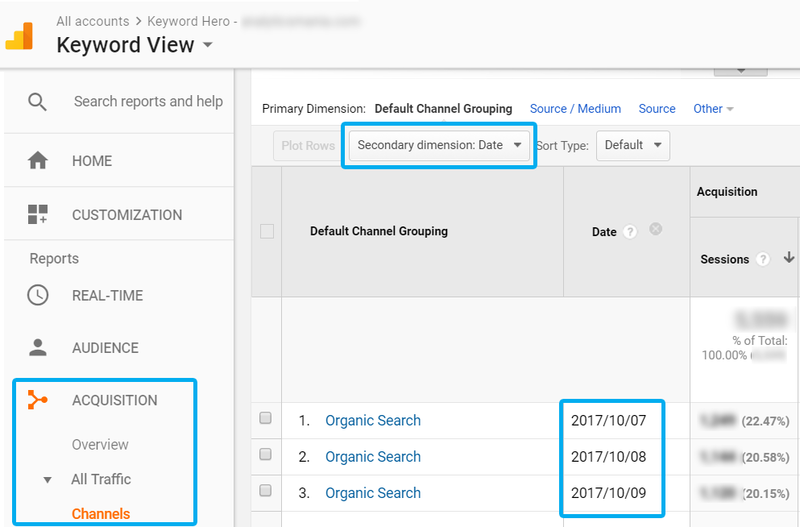 As the creators have explained, Keyword Hero analyzes the history of Google Analytics account and looks for patterns. Then it matches those patterns with the data from Search Console and 3rd party sources (e.g. browser extensions, Bing Search API, etc.). Combine Machine Learning, #magic, and you’ll unlock (not provided) keywords in Google Analytics. After taking a deeper look at the results, I have to admit that they really make sense. Contextually, keywords were matching landing pages, I could also easily identify which pages need more effort in order to jump from the 2nd to the 1st page of search engine result page (SERP). It took me about 2 minutes to connect the Hero. First, I linked my Google Analytics, then the Search Console and that’s it. Both my GA and SC accounts belonged to the same Google account so the installation and onboarding process went pretty smoothly. 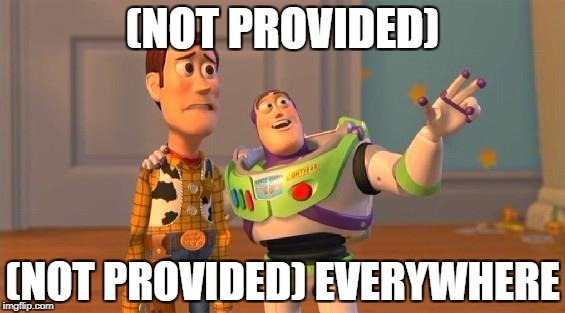 Everything was done via Google Authorization. After giving permission to access my data, I had to choose which Google Analytics property should be analyzed. Also, I had to choose either to analyze my e-commerce data or my goals. In this case, I had no e-commerce tracking implemented so I went with a conversion goal. Furthermore, Google Search Console (previously, Webmaster Tools) had to be connected. I chose two properties that were related (one with http:// and the other one with https://). See the screenshot below. So far easy, right? The next step is to create a mirror Google Analytics property so that you could isolate Keyword Hero’s data from your original data. If something goes wrong, your original GA property will not be affected. The 4th step is to choose a pricing plan. For starters, you can try using a Free plan and upgrade later. Personally, I’ve tried Free and Giant Hero (for 29$/month). If you run a small blog, KH can uncover up to 90% even with a Free plan, but the more popular pages you have, the fewer data will be uncovered, therefore you’ll need to upgrade eventually. Done! Continue reading and I’ll share some insights about this tool. There are some things to be aware of. After you’ve installed the Hero, you’ll have to wait a bit. The Hero uploads your data once a day, so it might take up to 24 hours for you to see data in the Keyword Hero property. What I also noticed, is that the traffic data on the first day was way too bloated. It was seeing about 100% more sessions that I really had. At first, I was like WTF? But later everything became clear to me. Since the data is imported from various sources, the data that you see today (in Keyword Hero’s GA Property) is really the data from three days ago. This is really important. 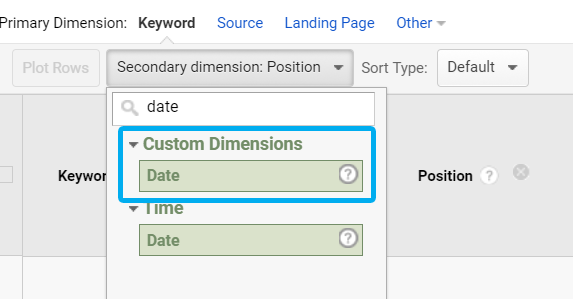 To not get confused, you can add the secondary dimension “Date” in your GA reports if you wish to see how keyword performed on a particular day. Back to my bloated number of sessions. I suspected that maybe KH pushed the data of 2 days into 1 day, and turns out I was right. When I added a secondary dimension, “Date”, I saw that I had the information of 3 days, not 2. Is it a serious problem? I don’t think so. My main problem is hidden keyword data, I want to uncover it and link to landing pages. Keyword Hero does exactly that. If I want to see some data day by day, I can just use custom dimension called date. Just keep in mind that there are two dimensions called “Date”. You need to use the one which belongs to “Custom Dimensions” because the other one is just a default GA dimension. But that’s not all. Keyword Hero adds one more custom dimension, position. This is the position of your site in the SERPs. If you see a 1, you were the first one on Google, a 12 means, that you were the second one on the second page of the results. To learn more about how to use KH, read their First Steps guide. Now that you’ve managed to unlock (not provided) keywords in Google Analytics, the next step is to unlock their potential. No more mystery, no more curtains. Here is an idea what you could do with all this new data, but don’t limit yourself. The sky is the limit! As I have mentioned in the previous chapter, KH also passes two custom dimensions, one of them is position. The hidden potential is among those keywords which are on the 2nd page of search results, especially, 11-15 positions. If you could update those blog posts or get more backlinks, they would appear on the 1st page, therefore your search traffic would increase. How do you find which keywords should you invest your time in? 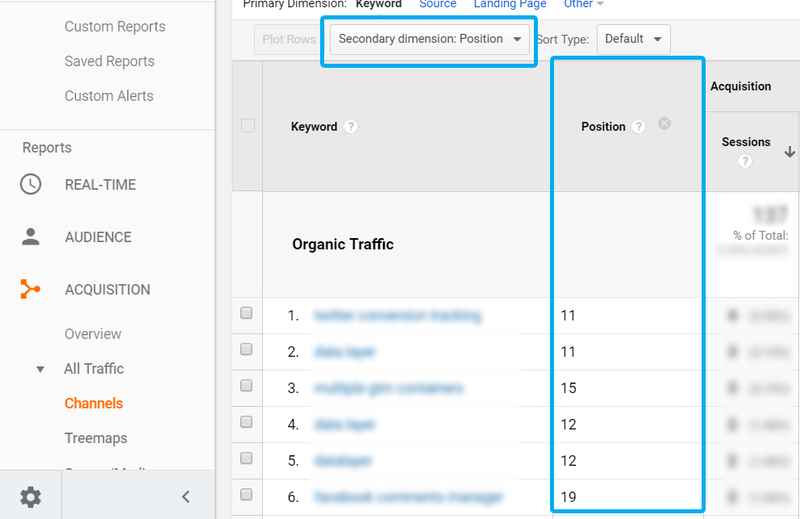 In Google Analytics, go to Acquisition > Channels > Organic Traffic and choose position as the secondary dimension. Then filter out only those keywords which are positioned in 11-20 positions. These are the keywords that you should work more with. What is the best way to improve search engine rankings? Backlinks, obviously. But if you feel a bit lazy, another way would be to update the content of your current pages. Add additional 500-1000 words per page, remove irrelevant paragraphs, change page’s publish date, resubmit the page to Google Search Console. Single Grain doubled their traffic with this tactic. It is not a magic bullet but some pages will definitely get the boost in SERPs. Little by little, we’re reaching the end of this blog post. But before we do that, here’s the TL;DR version with advantages and disadvantages of the Keyword Hero. It unlocks the chest of gems. All that hidden keyword data in Google Analytics is now finally back. Not too expensive. Turn that into an investment and see how you can increase your online traffic/sales. The data is pretty accurate. I tried to slice it from various perspectives and the data still made sense. I’ve also compared the number of sessions in my original Google Analytics property vs Keyword Hero’s property. The number of organic sessions differed by ~1%, which is acceptable. 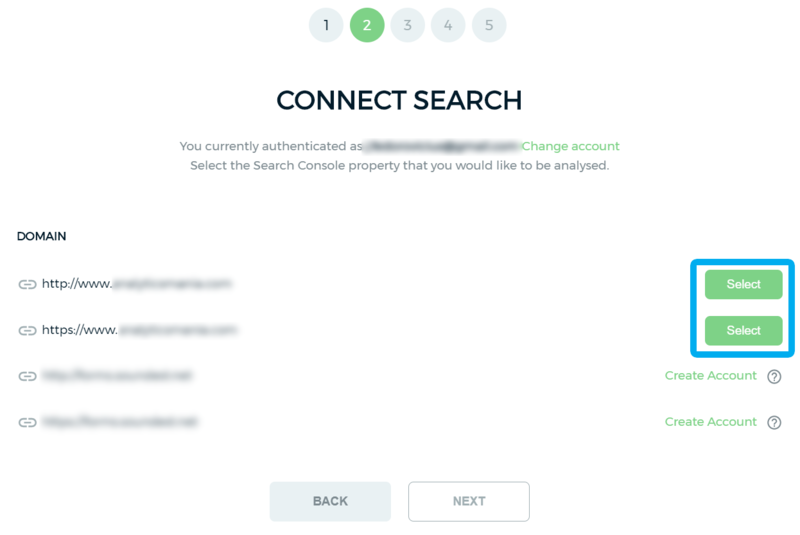 It creates a separate GA property, keeping your original data untouched. Small websites can benefit from a Free plan. That initial spike in sessions confused me and required additional time to dig deeper and find the explanation. A minor issue but still worth mentioning. Some audience-related metrics are missing or incorrect, for example, language, user’s browser. But that is a minor loss knowing that you get a big chunk of keyword data revealed. My verdict: Disadvantages are too insignificant. Keyword Hero is totally worth it! Keyword Hero is a great tool which helps you unlock (not provided) Keywords in Google Analytics. At first, when I heard of it, I was really skeptical. I mean, how accurate can this be? Later, I noticed various digital marketing experts (e.g. Rand Fishkin) sharing their joy and excitement about the Keyword Hero and how helpful it was. Turns out they were right. This tool unlocked almost 90% of my (not provided) data in Google Analytics and helped me improve my SEO efforts (although I have to admit, I don’t invest too much time in search engine optimization). 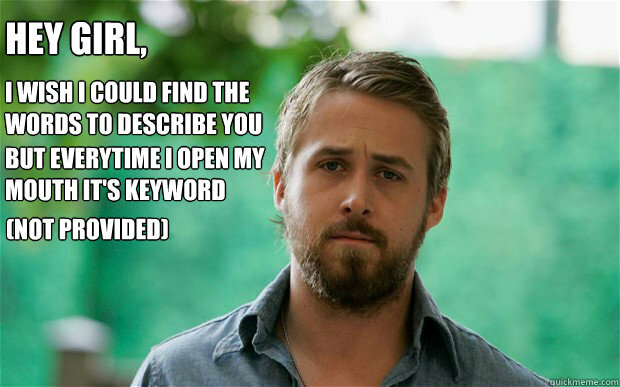 For dessert and relief, here’s a meme related to this whole (not provided) situation (from SEO Ryan Gosling). Damn, it feels good to say bye bye to those two words, not provided! 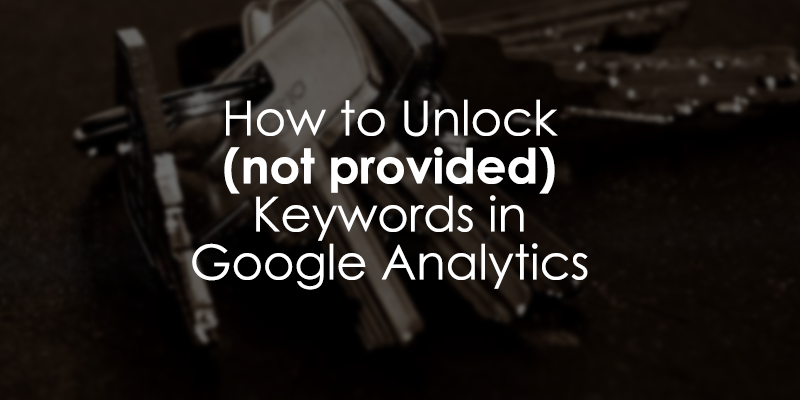 Did you manage to unlock (not provided) keywords in Google Analytics? How did it go? Let me know in the comments! Great post, definitively going to give it a try! One question, you mentioned that you selected a property to use and then two steps later created a mirrored property to add KH to. Wouldn't I want to create the mirrored property first then add KH to that property or am I understanding it wrong? Thanks for the cool tip! Hey, good question. 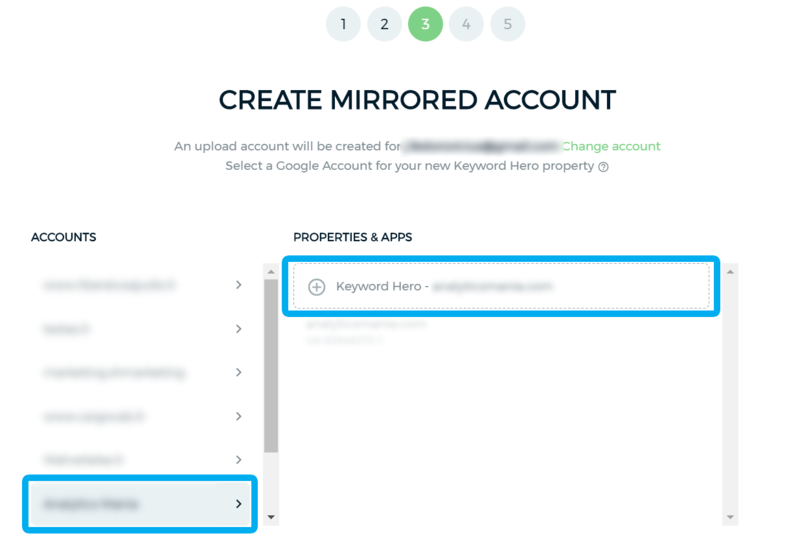 Creating a Mirrored property is just a part of Keyword Hero's onboarding process. I cannot choose the sequence of what I create first. First I had to connect my accounts, then I created a mirrored property. Julius, thanks so much! This is a great tip and can't wait to test it out. I know some of my bigger clients will have no problem with the 99/month program. Being integrated to show in GA is a plus for a lot of clients who seem to only want to stick to GA. Thanks! No problem. 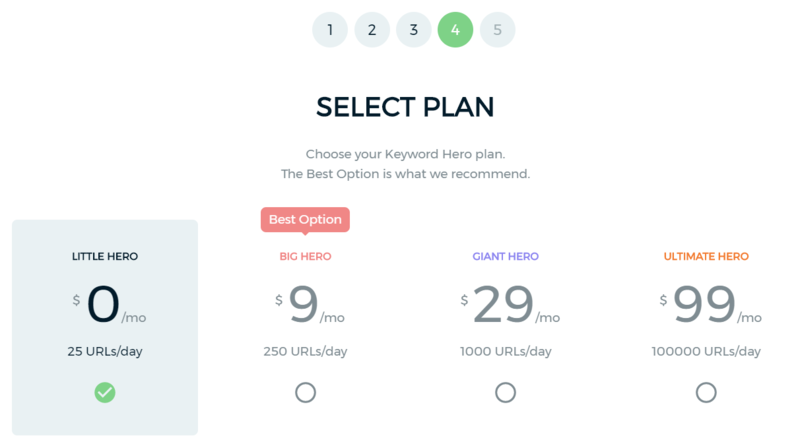 If you ever happen to upgrade to the paid plan of Keyword Hero, I'd appreciate if you'd do that by clicking this link first. I will get a commission per every new customer who's referral domain is analyticsmania.com. But that does not mean, that this post is purchased. I was amazed by KH and contacted creators by myself in order to start an affiliate partnership. Consider this is based on algorithms and matching, and considering we don't actually ever know what the terms searched were, how can one be confident in the accuracy beyond visual interpretation of matching keywords to landing pages? Not only did I visually check the landing pages and keywords, but I also took like random 30-50 matched keywords and entered them in Google Search (via Chrome's Incognito browser window) to check which pages of mine rank in search results. Search results exactly matched those pages which were displayed as landing pages in KH Google Analytics Reports. Even their positions were pretty close to what KH reported. But yes, everyone should keep in mind that there will not be 100% accuracy. Nevertheless, it's really really close. Interesting, will give KH a try. Thanks for the info!